As is becoming customary for me, I have to add something to my manis for a day to make them last a bit longer. 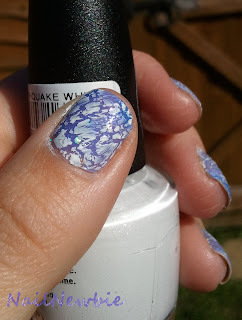 Last night I decided to use my white shatter over my sparkly lilac franken to cover up the tipwear and few chips. I applied W7 Earthquake White using diagonal brushstrokes, which gave more of a random crackle look. I really like it, although it does look a bit tippex-esque. I'm thinking clouds. 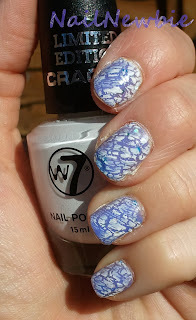 I am a bit over crackles but I like this one. I love the angular brush stroke ! I love the way this crackles and the angle you put it on. NOTD - My first franken!